This post was originally published on April 24, 2016 and republished on March 7, 2018 with updated content and photos. I was raised in an Italian neighborhood in Montreal – tomatoes growing in small backyard gardens, Sunday lunches lasting an entire afternoon; those sorts of things were commonplace. 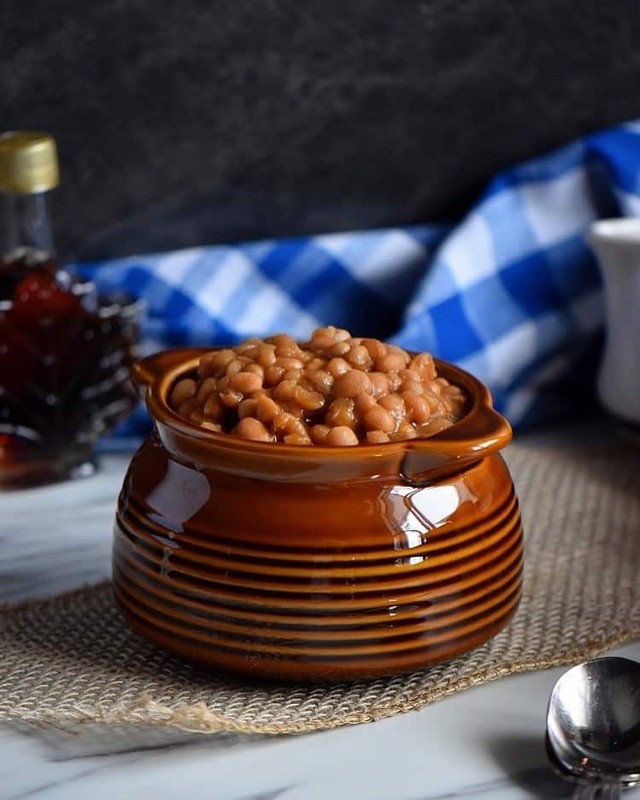 But growing up in Montreal also meant that I had the privilege of being exposed to so many wonderful French Canadian food traditions, such as this recipe for Homemade Quebec Maple Baked Beans. Any Quebecker will tell you that baked beans, also known as fèves au lard, are an integral part of any sugar shacking experience in the spring. But these baked beans can easily be enjoyed at breakfast, lunch or supper and throughout the year. They make one of the best sides dishes especially when served alongside this finger licking recipe for Bar-B-Barn Ribs. This easy baked beans recipe is so versatile that it can be easily adapted for your meatless Monday lineup. I have also provided you with cooking guidelines so that it can easily be made in your slow-cooker or oven. When preparing any recipe for baked beans, you will immediately notice that the prep time is minimal when compared to the idle time, and that it all starts with a good soak. remove any small rocks or debris. With regards to the issue of soaking your dry beans, there have been different opinions as to the necessity of this activity. In my humble opinion, providing your dry navy beans with an overnight soak will allow you to reduce the total cooking time. Furthermore, it literally takes a couple of minutes to fill up a bowl of beans with water and leave it for an overnight soak on the counter. The overnight room temperature soak can take anywhere from 8 to 12 hours. Make sure you submerge your beans by at least two inches of water as they will absorb a lot of water. Precooking the beans: Here’s another step which is highly debatable. Some will argue that since the beans will cook for a long period of time, this step is unnecessary. Once again, I will share the method that works for me. With that being said, I rinse and drain (again) the soaked beans. I will then place them in a pot of water where they will simmer for about 45 minutes. After which they get another rinse and are ready for the final step. 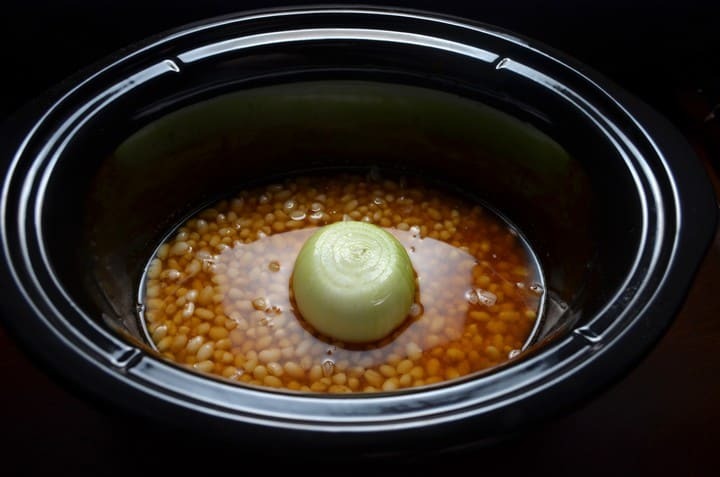 Slow cooker method for baked beans: Transfer the rinsed precooked beans in your slow cooker. Add the rest of the ingredients, stir together and place a whole onion in the center. Cover and cook on low heat for 6 to 8 hours or until the beans are tender. If the mixture appears dry, you can add some water. 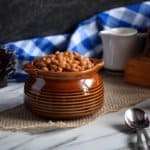 These crock pot baked beans can be served immediately or refrigerated and served reheated the next day. The flavor actually improves the longer they stay in the fridge. Dutch oven method for baked beans: Preheat oven to 225°F. Once again, transfer the precooked beans in your dutch oven or a large oven proof pot. Add the rest of the ingredients, cover and cook for approximately 6 hours. You can remove the lid the last 30 minutes or so in order to obtain a nice golden color. As with the slow cooker method, if the beans appear dry, make sure to add a little water. Non-vegetarian version: I prefer to make a vegetarian version of this recipe for Homemade Quebec Maple Baked Beans, however, I have been known to throw in some Italian pancetta or even some Canadian smoked bacon. The final product is creamy and smokey… just perfect as a main, as a side or even to top off those potatoes! Nutrition Note: There is nothing healthier than eating a bowl of baked beans. This low calorie food is high in fiber, which keeps your intestines working properly; it’s also a great source of protein, which promotes healthy muscle tissue. As an added bonus, it even has a low glycemic index. There are just a few of the benefits of baked beans. Follow this link to find out more! As I have preciously mentioned, I have a very large collection of newspaper clippings from the Food section of the Montreal Gazette. I’ve adapted this recipe from one such clipping. 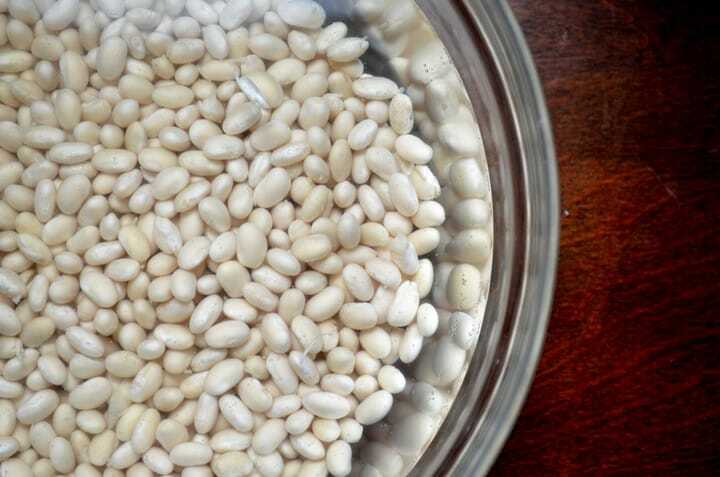 If you recall, this is not the first time I have sung the praises of the great white navy bean. 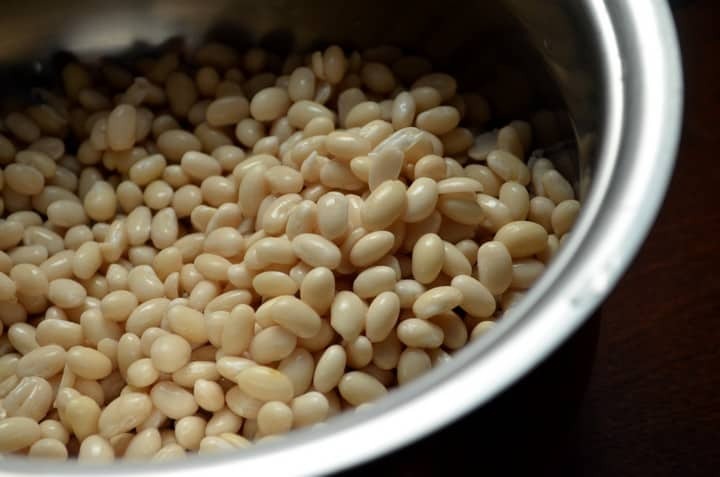 Last fall, I shared a recipe for an Easy White Bean Soup. 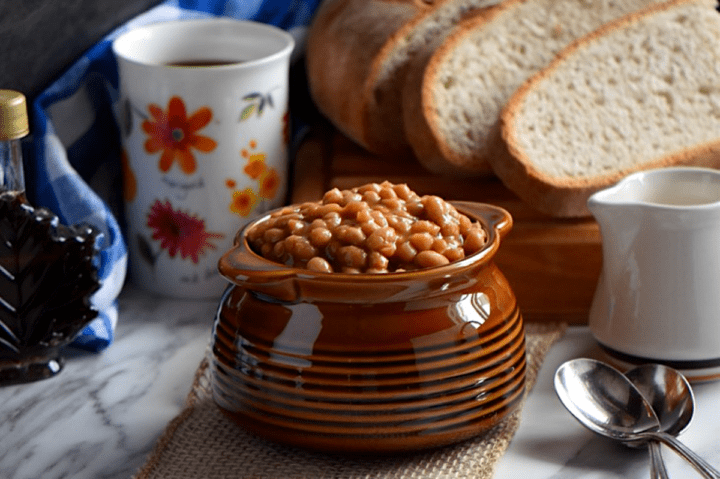 Healthy Homemade Quebec Maple Baked Beans for your Sunday Supper… why not? 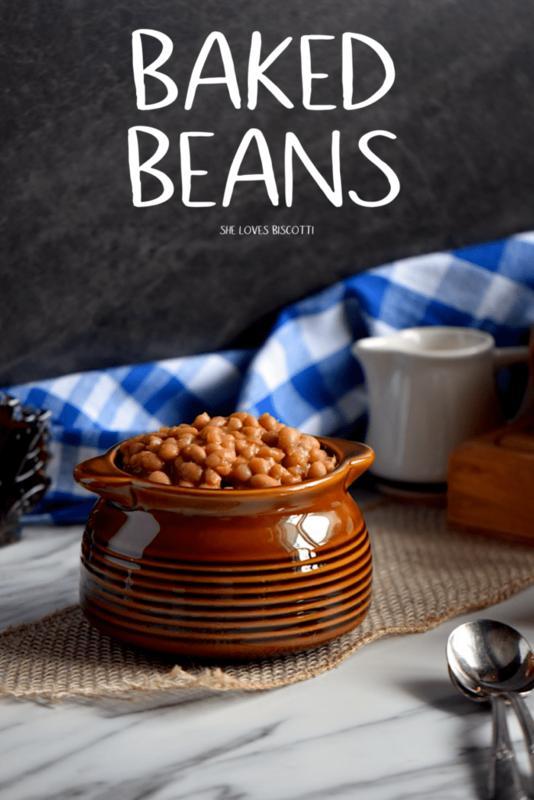 ★★★★★ If you have made this Baked Beans recipe, I would love to hear about it in the comments below and be sure to rate the recipe! Baked beans can be enjoyed at breakfast, lunch or supper -throughout the year. This recipe for Homemade Quebec Maple Baked Beans is truly that versatile. Also provided are cooking guidelines so that these baked beans can easily be made in your slow-cooker or oven. Make a batch of these great tasting baked beans today! Rinse and sort the beans; remove any pebbles or debris. Fill with water in order to submerge the beans by at least two inches of water. The next day, transfer the drained and rinsed again beans to a large pot. Re-fill with water and bring to a boil. Turn down the heat and simmer for about 45 minutes. Remove from heat and rinse again. Transfer the rinsed precooked beans in your slow cooker. Add the rest of the ingredients, stir together and place the whole onion in the center. Cover and cook on low heat for 6 to 8 hours or until the beans are tender. If the mixture appears dry, you can add some water. Once again, transfer the precooked beans in your dutch oven or a large oven proof pot. Add the rest of the ingredients, cover and cook for approximately 6 hours. Remove the lid the last 30 minutes or so in order to obtain a nice golden color. As with the slow cooker method, if the beans appear dry, make sure to add a little water. These Homemade Quebec Maple Baked Beans can be served immediately or refrigerated and served reheated the next day. These baked beans can also be frozen. For a non-vegetarian version you can add about 1/2 cup of uncooked Italian pancetta or about 6 cut up slices of Canadian bacon to obtain smokey flavored baked beans. DO YOU LOVE THIS BAKED BEANS RECIPE? Today’s Sunday Supper theme was regional specialties, and I just had to sing the praises of these baked beans! Every Sunday, there is a wonderful group of bloggers called the #SundaySupper tastemakers that collaborate together on a theme. As was mentionned, today’s theme was Regional Specialties and I think you’ll agree the line-up of recipes is totally amazing! I would like to thank the event host for this event: Sue Lau from A Palatable Pastime Thanks Sue! If you have a chance you should really check out these great regional specialties contributed by these wonderful food bloggers. Hi, I dont own a Dutch oven. Can I use a stainless steel pot in my oven or better yet can I cook this recipe on my stove top? Looks really good, plan on making this for Easter! Hi Nella, Stovetop is fine. Naturally you will cut down on the cooking time. Keep an eye on it and just keep adding water as it evaporates until the beans are cooked. These are actually better 24 hours after you make them. So, on the day you are planning to serve them, the only thing to do is gently heat them. Wishing you and your loved ones a Happy Easter! Thank you so much for your quick reply. Love that I can cook these on my stove but love even more I can cook them a day ahead. Yay!! I love this recipe! It turns out perfect every time and is truly delicious! I am thrilled to hear this Nym! Thanks so much for taking the time to comment, appreciate it! I used this recipe ,We like them .I used Yellow eyed beans and a Medium Amber Maple Syrup.. I plan on making this recipe again with a Dark Maple Syrup. That’s great Amy. Thanks so much for taking the time to share your experience with this recipe. Appreciate it! Hi Maria! I eat vegan and love to bake and cook. I searched many baked been recipes and your simple one resonated with me that most. I have started the process as I write this. My only question is I am unclear on what to do with the whole onion at the end of the baking process as nothing more is mentioned about it. Does it cook down and sort of fall apart in the beans? If not, does it get cut up and mixed in? Or, does it get discarded? I so appreciate your feedback and I am sorry if I missed something about it in the instructions, I have an old baked bean crock my mother used to use, and plan on baking them in that. Yippee! Thank you so much for the recipe and your time! Happy cooking! Hi Eric, thanks so much for reaching out. I hope you are going to love these simple but tasty baked beans as much as we do. The onion cooks down… I like to chop it up and eat it. Other members of the family do not particularly care for it. It really is up to you. I will update the post with more specific information. Thanks so much for pointing that out to me, appreciate it. Have search a while for a ”from scratch” recipe. Looks to be one of the best I’ve found. Look forward to the finished dish. Thanks for sharing. Have you ever added liquid smoke, if so how much. If not any thoughts? What a great comment. Sorry for the delay in responding to you Bryan. I have no experience with liquid smoke so I was busy asking around. From what I was told, this would definitely add another layer of flavor. I would say start with 1/2 teaspoon and work your way up. Hope you get a chance to try these baked beans. Thanks for taking the time to leave a comment, appreciate it.